Do you want to donate your car! and get a nice tax deduction? Call us at (317) 454-3202 or click here for more information. Want to get rid of that junk car? Have a car to scrap? We are the largest junk car buyer in the Indianapolis area and we always pay cash for your junk car! We offer FREE towing for your junk car! Always FREE towing when we buy your junk car! Most junk car buyers won't even consider buying a junk car without wheels and tires, or abandoned rat rod car projects that are now junk cars, flooded junk cars, or burned junk cars. We will take any of them. All we ask is to please let us know ahead of time so we can send out the correct tow truck. Many people wonder how to choose the right company to buy their used or junk cars Indianapolis. (317) 454-3202 . They want to know what makes us different from the other junk cars buyers in the Indianapolis area. So what does make Indianapolis Junk Cars different from all of these other companies that you see advertising all over the place or see on the side of their tow trucks? All we do is buy junk cars. We don't run a junkyard, we don't run a towing service that only buys junk cars when we aren't doing anything else. We operate our own tow trucks, just to pick up your junk car or truck and tow it in free. We pay you cash on the spot when we pick up your junk car or junk truck. We not only serve the Indianapolis metro area, we pick up junk cars in the surrounding areas like Brownsburg, Carmel, Fishers, McCordsville, Noblesville, Westfield, Franklin, Greenwood, Whiteland, Plainfield, New Palestine, Greenfield and other surrounding areas. Call us for cash for your junk car or truck. We are Indianapolis junk car buyer. We always pay cash for cars! Junk Cars Indianapolis is a family owned operation that has been in the car business since 1989. This many years in the junk cars business in the Indianapolis area has given us many contacts and many outlets for our junk car buyers. This allows us to pay more cash for junk cars Indianapolis area than any other cash for cars buyers in Indianapolis. Call Junk Cars Indianapolis first. We always pay cash for your junk cars! get cash for junk cars in Indianapolis from us and you'll be extremely satisfied! Junk Cars Indianapolis, Indiana is now one if Indianapolis best junk yards. If you are looking for a junkyard in Indianapolis, try out Junk Cars Indianapolis. They sell used engines, used transmissions, used batteries, used starter, used alternators and many other used auto parts. They have some of the best prices on used engines and used transmissions in Indianapolis. On this page you will find a way to get top cash for junk cars Indianapolis, and we will buy them and give you cash for junk cars Indianapolis even if they don't run. We buy both running cars and junk cars. The best part is you will get a no hassle cash offer. On this page you will find a way to get top cash for junk cars Indianapolis, and we will buy them and give you cash for junk cars Indianapolis even if they don't run. The best part is you will get a no hassle cash offer. We pay the most for junk cars in Indianapolis and we always pay cash for junk cars. Many people wonder how to choose the right company to buy their used or junk cars Indianapolis. (317) 454-3202 . They want to know what makes us different from the other junk cars buyers in the Indianapolis area. The one thing that sets Junk Cars Indianapolis apart is all we do is buy junk and running cars. We have several junk yards or salvage yards in the Indianapolis area that we deal with. We also deal with several used car lots and car dealers in the Indianapolis area that buy both junk cars Indianapolis and running cars. We are constantly in contact with all of them to know exactly what inventory they are needing at any given time. This enables us to pay you the most money for your junk car or junk truck. We do buy both junk cars and running cars in the Indianapolis area (this includes Carmel, Brownsburg, Fishers, Greenwood, Whiteland, Franklin, Greenfield and the whole Indianapolis metro area). As a matter of fact we love running cars. You can call us and have us come out and make you a "no obligation" cash offer for your car or truck. We are the place to get rid of your junk cars in Indianapolis. It don't matter if your junk car don't have wheels, or if your junk car has been wrecked, or if your junk car don't run. We will pay you top dollar for your junk car in Indianapolis. Beech Grove Towing is locate in Beech Grove, Indiana. If you need a tow truck, give us a call. We will be there right away. Indianapolis Junk Cars-We are always looking for junk cars. We pay cash for junk cars. If you have a junk car sitting around your yard that you need to get rid off, just give us a call. We pay top dollar for your junk car and tow it in for free. Call us at (317) 454-3202. We always pay cash for junk cars Indianapolis. We buy junk cars every day all day. You would be amazed what some people sell for a junk car. Now me being a car lover, sometimes makes this job tough. I just can't let some classic cars become junked. The other day I passed one of my favorite classic cars, but it was no junk car. I had to take a picture of it. 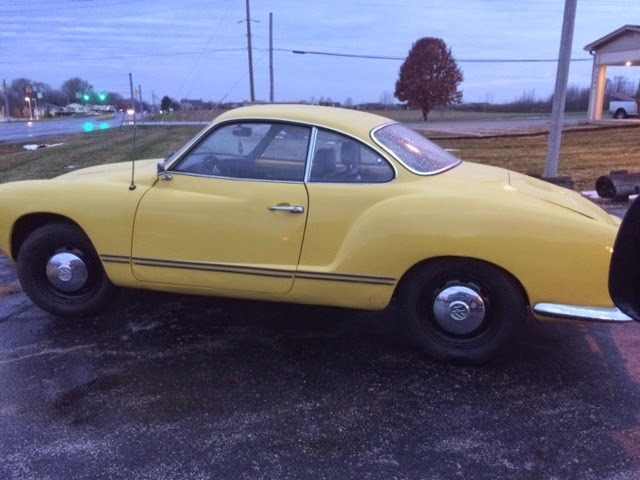 It was a early 70's Karmann Ghia built by Volkwagen.. Here is that car.